When doing online marketing you often need to make online forms. 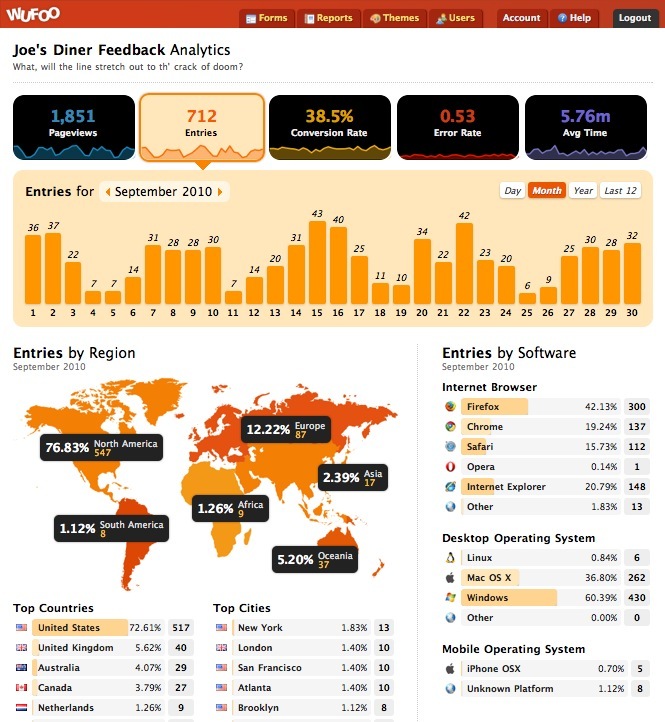 There is dozens of different services who offer free and user friendly tools. 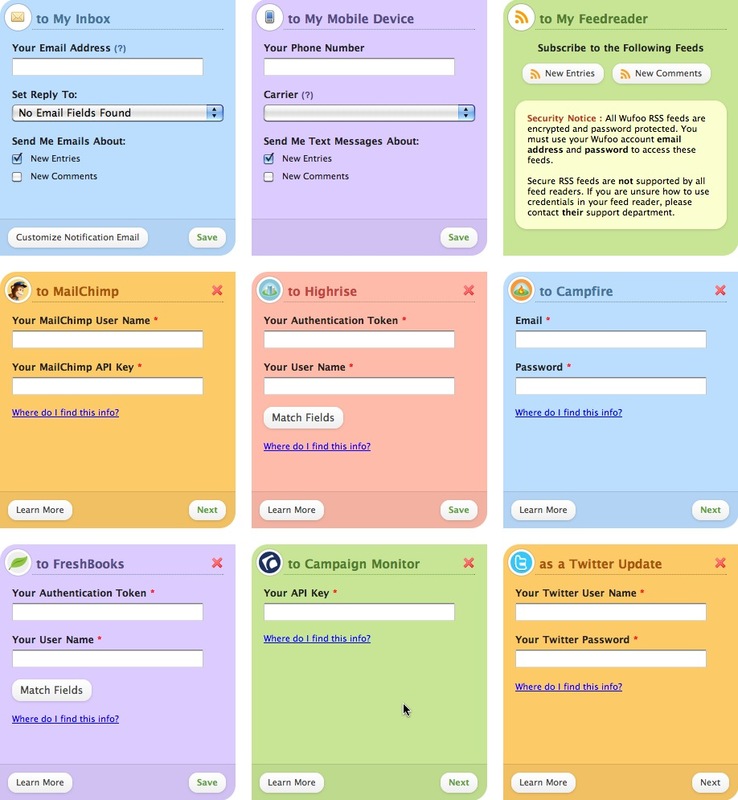 Wufoo is an Internet application that helps you build online forms. When you design a form with Wufoo, it automatically builds the database, backend and scripts needed to make collecting and understanding your data. Wufoo is hosting everything, so all you need is a browser, an Internet connection and a few minutes to build a form and start using it right away. 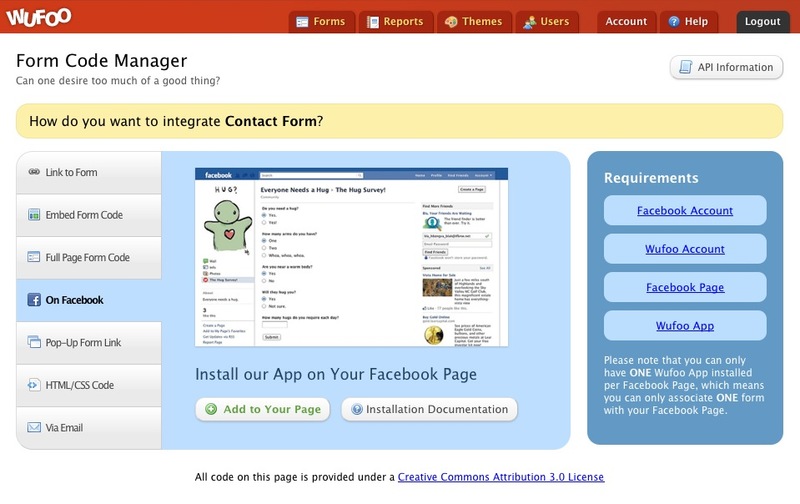 Read about why forms is important in online marketing on our CRM / Newsletter page. What can I build with this? 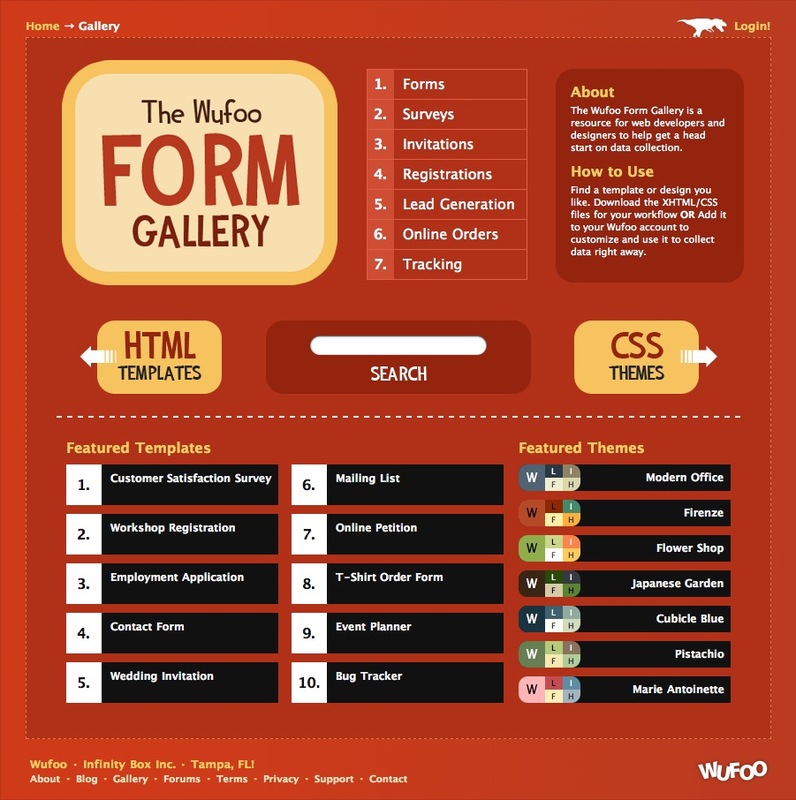 Wufoo’s Form Builder provides the tools for anyone to easily drag and drop form elements into a form. With this you can make a complex form in just a fem minutes. Theme Designer can help you create nice themes to match your organization’s identity and apply them to your payment forms, reports and invoices. You can use your own logo and colors or pick a professionally designed palette from our Theme Gallery. Wufoo’s Code Manager provides a number of copy-and-paste code snippets to help you embed your form into your web site, blog post, email newsletter or Facebook page. When you design a form with Wufoo, Wufoo automatically build the database and validation scripts needed to make sure the data you’re collecting will be nice and tidy. You can make any field required and Wufoo will take care of actions like making sure emails are properly formatted or the number of words you require are met. 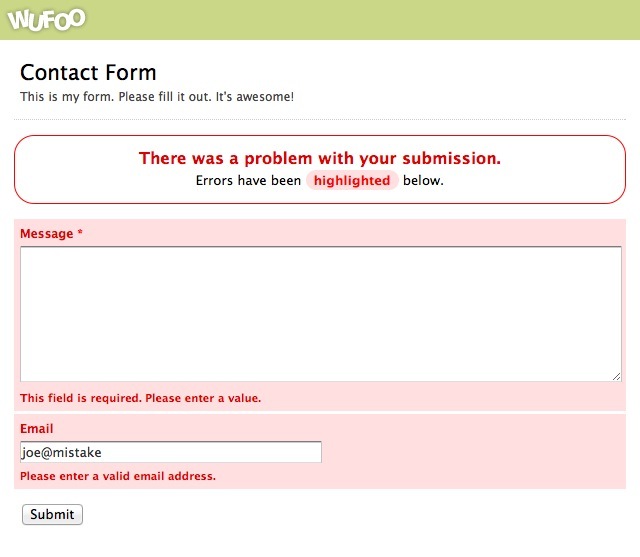 Plus, Wufoo show all their errors in easy to understand prompts to help keep your conversion rates high. Your teams and businesses depend on the ability to react quickly to the leads and registrations gathered from your web site/social media platforms. With a Wufoo powered form, you can easily get real time updates about the data being collected from your users right into your favorite web applications. Wufoo provides a number of ways to deliver live updates about new payments and transactions processed by your form. In addition to dynamic reports that you can customize yourself, you can have Wufoo send you emails, text messages or even a secure RSS feed to keep you updated on the money rolling in the door. Wufoo provide a powerful Report Builder to help you create dynamic visualizations made up of your own graphs, charts and key metrics. 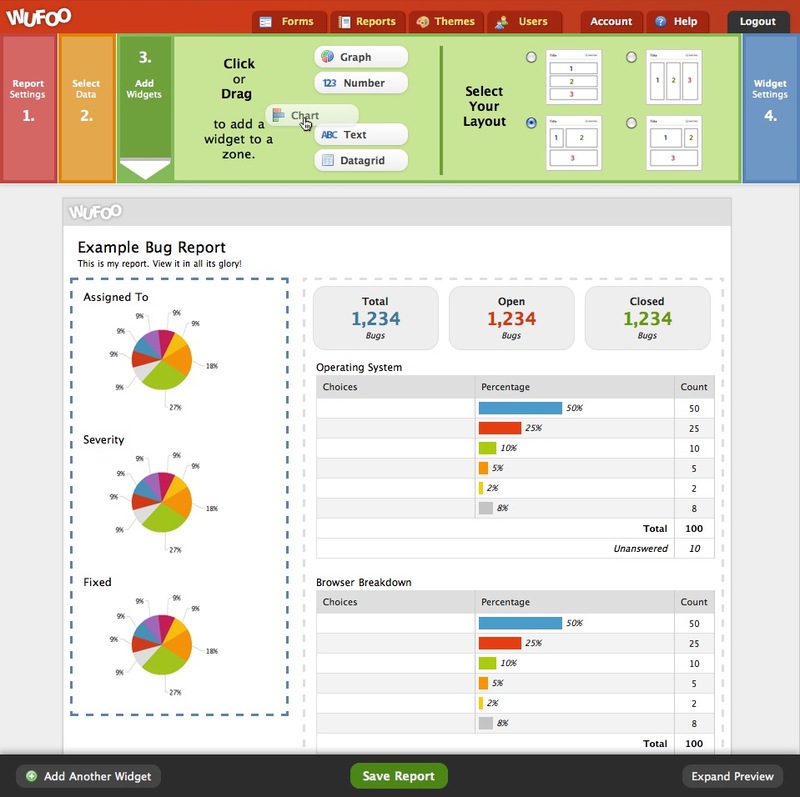 Wufoo`s Report Builder allows you to design your reports using 5 types of widgets (Graphs, Charts, Numbers, Text and Datagrids) that you can easily add, mix and match in your reports. If you’re using our Payment Integration features, you can easily see how your payment forms are performing by tracking their views, submissions and conversion rates. After designing your report, you can then make them public for all the world to see or password protect them for trusted eyes only. 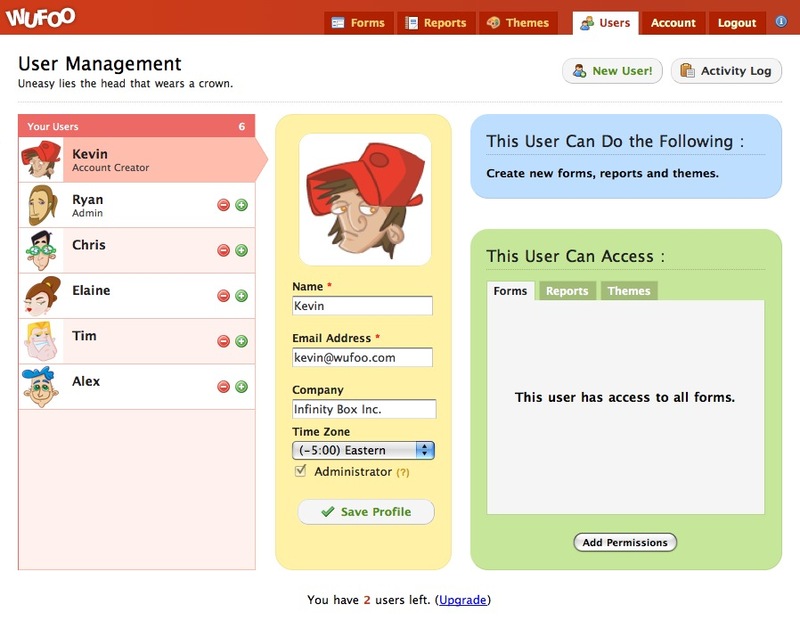 Specifically, User Management allows for multiple email addresses to log in to the same account. Each email address, or user, can be assigned Create, View and Edit permissions on Forms, Themes and Reports. Whether it’s small businesses wanting individual logins for each user, large companies hoping to separate their account by divisions, or design shops looking for an easier way to set up an account to each of their clients — everyone had a need for User Management. In addition to helping you collect information from your users, Wufoo also provide some really nice data on the performance of your forms as well. For every form, they provide detailed form analytics on pageviews, conversion rates, error rates and submission times to help you understand at a deep level how your forms are performing by region and platform. Additionally, since theire’re tracking this data over time, you can easily see how changes to your form affect your conversion rates. While Wufoo makes it easy to build most forms in a few minutes, it’s often not necessary to build your form completely from scratch. 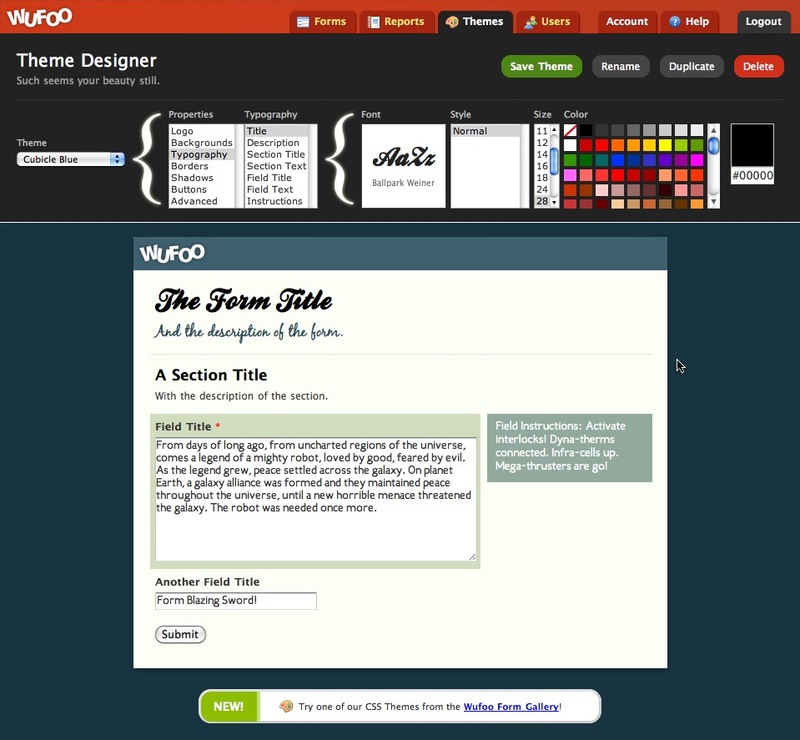 Wufoo provides you with a big collection of pre-made templates and themes. With our File Upload Field, you can have your users upload documents, photos and other media along with the other data you collect from them via your Wufoo form. This makes it really convenient to ask for screenshots on a Customer Support Form or accept resumes in PDF or Word on an Employment Application form. The possibilities are endless when you can easily accept and store files from your users. 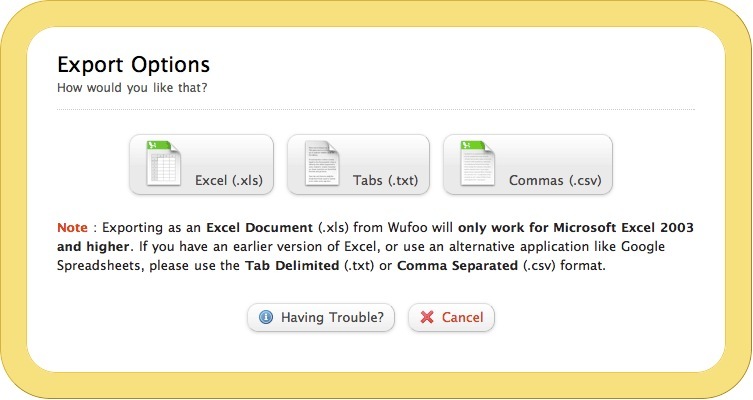 Wufoos intuitive filtering controls makes it easy to sort and filter your entries down to the essentials and if you’re a statistics power user, wufoo allow you to quickly export your collected information to Excel, CSV and Tab Delimited formats so you can import your data into your favorite spreadsheet number cruncher. Then you are ready to make your first form! Hit the ” New Form” button! 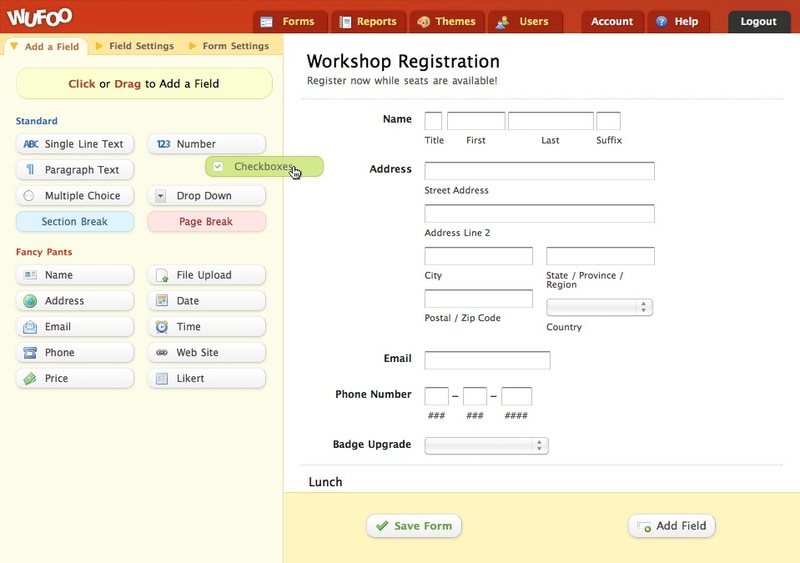 You will be able to choose from a lot of pre-made forms or you can build your own form from scratch. Browse trough the list and hit the green button ” Add to Wufoo ” when you are ready to move forward. Your new form will the open so you can edit or Save the content. Note: You can add fields and edit field info by clicking on the field itself. For now we will only change the Field Size (to small) so it fits better in our app. Make the change and click ” Save Form “. When finished editing your form click ” I`m finished! Take me back to the Form Manager “. For this tutorial we need to use the button ” Code “. If you click this button you will get to a page showing code snippet you can use if you want to integrate your form on other web sites.